Used to rant, cry and share with you at your place. I remember that particular day, I'm glad I came to you. Coz' I found a friend there too. I never could have imagine that one day I will never ever see you again. You were one of my baby, I wished I had more time, spending the end with you. I have never announced it officially here, that I had been with you since 2007. It's been years. To found out that you were actually dying soon, makes me sad. I got devastated. What can I do to make you stay? I have no choice but to let you go. Reading and sharing stories with strangers. People whom you never met before but shared a thing in common. Something that could make people come together, danced the night & day. Music heals you, your soul. Let it be. I save the last print screen before the site shuts down for good. And I am talking about MTVAsiaBlog.com. This is the front page where members log in the site. 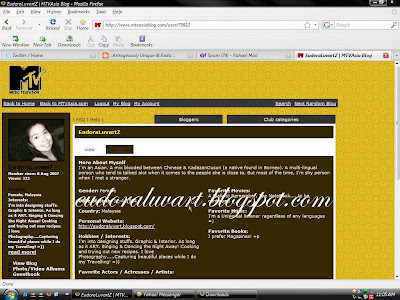 My Profile Page and I'm not going to print screen the blog contents though. 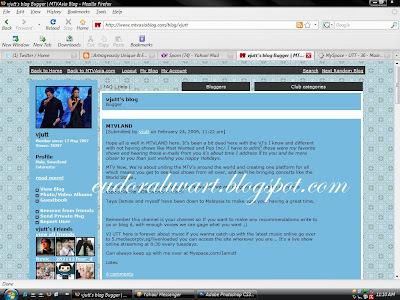 And this is where, I stalked VJ Utt, with his very own space or blog at this site. I don't have much quality time there but I'm glad I'm once a part of it! 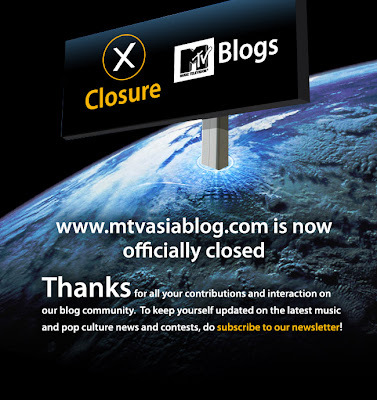 so sad right the blog is now closed, though we didnt really update it, still, our memories, are gone! nice blog :D I LIKE IT!!! Whoa... Why did it close??? @d1n0za : I'm not that sure. But probably due maintenance of server or something.